As many of you have heard (enough of, I’m sure!) last week was a monumental week for me. I finally… after putting it off for six years, passed the NCE (National Counselor Examination)! This was a frightening task for me, as I’ve been out of grad school since 2006, have had babies, raised babies; and my brain sometimes feels as if it’s been through the extra-hot wash cycle on my dishwasher about 100 times over. Fact-retention has never been my unique ability, let’s just say. So I was beyond thrilled to see a high passing score on this exam! Thankfully, I have some sense of how the food I eat impacts my brain potential… and I know that feeding brain cells–mitochondria–Is really important to a happy healthy brain and body. So I made a point of focusing on my self-care A LOT during the intensity of crazy study hours, days & weeks! My food was–and is–my fuel for thinking, reasoning, problem-solving, Mindfulness, self-soothing, and ultimately for my ability to relate well with others. When I’m practicing good self-care, I can ultimately nourish my relationships with a healthy, grounded perspective–and the energy to back it up! As time would have it, I was preparing for this exam during the final days of my lovely garden growing season. The last of many greens and veggies were finding their way into unique food combinations so that I could use every last bit! This year, I grew beets for the first time and, WOW! I love beets in salads! Especially salads with a sweet and savory blend. I made the following recipe during a study break–I felt like I was so craving the physical practice of nourishing myself, and these ingredients just seemed to make their way into my bowl together in a way that was completely satisfying, in both the creation process and the indulgence in taste sensation! I will mention that the EVOO & Balsamic came from a really wonderful little store in downtown Littleton, Colorado called EVOO–it’s literally a “tasting bar” for olive oils and balsamic vinegars! Amazing. If you can’t find anything similar, just keep the flavor combinations in mind. My mouth waters just thinking about it! I do hope this salad is one that people will explore and share over and over. Maybe because I have such positive feelings regarding how nourished it felt to me during intense anxiety… I definitely think this one’s a keeper! 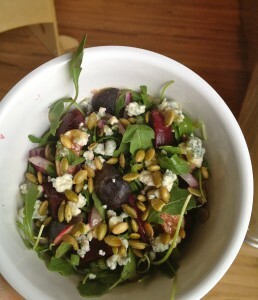 This entry was posted in Fit Food, Fit Mind and tagged Arugula, beets, Brain food, EVOO, figs, mitochondria, Salad by Angie. Bookmark the permalink.